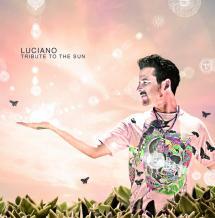 All tracks written & produced by Luciano for Cadenza Records. Mastered by Rashad @ D&M, Berlin. Published by Cadenza Publishing. (p)&(c) Cadenza Records 2009. All rights reserved. Made in Eu. Distributed by Wordandsound. Tribute to the Sun is above all a highly personal portrait of the artist. Informed by the ups and downs of the artist's life, and the balancing act between life on the road and the refuge of family life in rural Switzerland, its moods run from the heavenly grace of "Celestial" to the outright madness of "Metodisma." This is the fullest portrait yet of Luciano as not just an artist but a human being. Four years in the making, the album finds Luciano collaborating with a cast of musicians as talented as they are diverse. Martina Topley-Bird, of course, is known for her haunting contributions to Tricky's early classics, as well as for her solo career and collaborations with the likes of Danger Mouse and Mike Patton. Senegal's Ali Boulo Santo, heir to a long line of griots and nephew of the legendary "King of the Kora" Soundioulou Cissoko, was said to be "born with a Kora in his hands"; he pioneered an electronic fusion of Mandingue Afrobeat in his recordings for Frédéric Galliano's Frikyiwa label, and here his contributions continue to expand the possibilities for "world" music in new contexts. Switzerland's Bruno Bieri is the inventor of the Hang, a kind of steel drum with a sound like a mountain stream; "Hang for Bruno" features both his limpid melodies and the contributions of the Israeli percussionist Omri Hason, a student of the Iranian master Djamchid Chemirani. Omri Is also part of Luciano’s live project Aether.